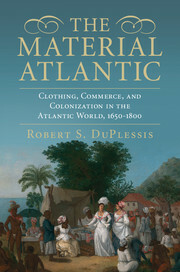 Robert DuPlessis, the author of The Material Atlantic, answers questions about the textile industry in the early modern period, the rise of Atlantic trade, and the birth of fashion--they're all connected! Your book, The Material Atlantic, examines the textiles and apparel that became available to consumers during the 17th and 18th centuries in the Atlantic world, and how and when they were acquired. There is so much that you cover – economic history, globalization, colonialism, consumption, fashion – how did you begin, and what resources did you find the most useful? My prior work on European cloth production and more generally on early modern economic history left me wanting to know more about exports and consumption of textiles within the context of globalizing trade. The resulting material cultural interactions—a key topic of this book—were particularly intense throughout the Atlantic basin, both in colonies and elsewhere in an increasingly integrated commercial system. To explore these topics I turned first to a source that I’d used a bit previously: probate or post-mortem inventories. Inventories raise many problems of interpretation, which I discuss in the introductory chapter of The Material Atlantic, but they are abundant and indispensable for studying (among many other things) textiles and clothing offered by merchants, retailers, and other suppliers, and the fabrics and apparel that individuals acquired. With rare exceptions, however, inventories were compiled only for free settler decedents of European descent, though I was fortunate to discover some fascinating ones drawn up for free people of color in Saint-Domingue (Haïti) and Cape Colony (South Africa), and for a Native American leader. But to find out about the dress of enslaved men and women, as well as less prominent indigenous people, it was necessary to look at many other sources—missionary reports, travelers’ accounts, merchant records, government documents, and all sorts of images, by semi-trained (often clerical) as well as professional artists. All these sources were partial in every sense, but examined together—including, at times, with inventories—they revealed the contours of dress cultures across a significant social selection of the people living around the vast Atlantic basin. How did you decide when to begin and end your story? What was particularly interesting about the early modern Atlantic world to you? Europeans started exploring and trading in the Atlantic in the fifteenth century, and in the 1500s began to colonize and exploit natural resources. But only from the mid-seventeenth century did commerce, migration, and settlement produce a network of relationships—what the historian Pierre Gervais terms “a shared Atlantic world”—such that it makes sense to analyze patterns of consumption and dress culture creation throughout the basin as a whole. By the late eighteenth century, the foundations of that Atlantic world were crumbling, as the American and Haitian revolutions ushered in a first period of decolonization and as the industrial revolution began to remake the global economic order on which the Atlantic world depended. Still, in the intervening century and a half Europeans constructed their first overseas settler empires; mass enslavement coupled with forced migration provided labor in plantation agriculture throughout that European imperium; consumer good production and consumption globalized; and prolonged encounters among immigrants, coerced and free, and indigenous peoples and cultures took place. All these phenomena, which for better and for worse have shaped the modern world, were the context in which the dress practices of early modern Atlantic people developed. How much of the trade was driven by “regular” consumers? Was there such a class? To what extent did “fashion” or the desire for new goods feed the trade? Were there any resources that were especially key in working this out? Depending on place and time, the regular consumer might be indigenous or immigrant, enslaved or free, might be getting fairly standard garments for everyday wear or seeking novel dress for a special occasion. Consumption, especially of items such as clothing, is usually imagined as the expression of free choice, individual decision, and personal style. Yet many people throughout the Atlantic basin—notably slaves—had their attire imposed upon them; for them, adoption of new dress fashions was an imperative rather than an option. Indigenous people, too, faced constraints due both to missionary and official gifting policies and to limited merchant offerings. The apparel and dress practices that emerged in such restrictive circumstances are central concerns of The Material Atlantic. But the book also presents the ways that Atlantic people—even under very unfavorable conditions—managed to create fashions that displayed individual styles as well as distinct sociocultural identities. Uncovering fashion developments in the seventeenth and eighteenth century Atlantic world sometimes involved decoding sources in which dress was only incidentally or obliquely considered. But dress was often a major subject for both writers and artists, because what people wore was widely considered an index of their potential for commerce, conversion, or conquest. And occasionally a document or image would openly address fashion rather than just clothing. Travelers did this a lot, particularly Europeans who commented disdainfully on colonial dress habits. But clergy could also be sharp observers; perhaps my favorite (and certainly one of the most fulsome) was the French Jesuit Paul Ragueneau, who in 1657 reported on the Native North American fashions—including bodily ornamentation—that he had encountered in missionary work in the Saint Lawrence River valley. For the most part, Ragueneau didn’t judge those fashions favorably, but he was fascinated enough to provide a wonderfully detailed account, further enriched by comparisons to contemporary French practices. What do you think someone who is interested in understanding the culture, economics, and industry of fashion today might learn from your book? How does your book speak to those interested in fashion today? The Material Atlantic demonstrates that fashion has multiple origins, modes of expression, and meanings, even while it draws on broadly available materials and widely circulated styles. Free settlers sought to emulate metropolitan modes, which they learned about from new forms of product promotion and marketing or even ordered directly from European centers. Yet most Atlantic fashions were created in all manner of locations beyond the metropoles by diverse people and comprised disparate amalgams of occupational and environmental needs, social identifications and aspirations, long-standing and new cultural rules, and locally available supplies of cloth and other dress materials. Hybrid in character, and involving novel fabrics, apparel, and styles along with rearrangements of existing items, these fashions involved not just apparel but the totality of body covering, notably hair treatments and corporeal ornamentation—tattooing, body painting, and piercing. Thus Atlantic fashions prescribed, governed, and expressed behavior and attitudes of a wide array of people rather than providing a uniform template. Participants had unequal access to the stuff of fashion, as wealth, status, gender, and occupation helped determine individuals’ and groups’ ability to determine their dress styles. But fashion creation was ubiquitous.